About 1991 or soon after, most of the major brands of analog servos became compatible with each other. When this happened, you can use any of these brands of servos with any brand of receiver, but you must be careful about the polarity of the wiring. Some brands of servos are really great for a particular use in a particular plane, and there are other companies that sell their servos with each different manufacturer's connector installed (you just have to ask for what you want). You can mix Futaba servos with an Airtronics receiver, mix Hitec & JR servos with a Futaba receiver, etc. as long as you are careful about polarity. 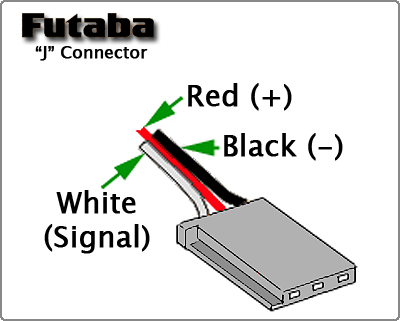 In Futaba, Hitec, and JR Radio servos, the servo and battery connections have the same polarity (+/-) and signal wiring, although the connectors are slightly different. One thing to remember: You can't reverse the direction of a servo (reversed servo) by just swapping (+) and (-) wires. If you do, you'll burn out either the servo or the receiver or both. If you're really good at soldering very small wires, you can reverse the normal direction of servo by swapping the wires that connect directly to the servo motor inside the servo case as well as the little servo wiper that moves as the servo moves. 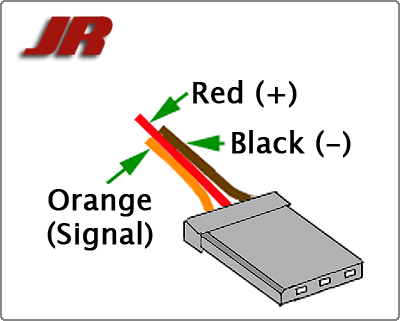 However, it's a lot easier to buy any of the newer radios; even the cheaper, standard radios these days have servo reversing as a built-in feature of the transmitter. Because Airtronics received so much bad press about the fact that their servos had reversed polarity (+/-), in December 1997, Airtronics started shipping servos with the optional "Z" connector that mostly matches the connector found on JR Radio or Hitec servos (or other brands). 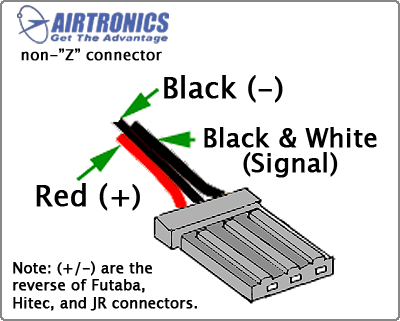 This means that if you have a Airtronics servo with one of the "Z" connectors, you won't have to switch (+) and (-) wires to use that servo with Futaba, Hitec, or JR, or other receivers. If you want to switch the wires around, almost all the connectors have little tabs or pins that you can push with a small pin to remove the wires and push them back into the connector in the right place. If you are handy with a razor knife, you can get all the brands of connectors to fit each other. I usually cut off the little flat tab on the Futaba connector to get it to fit in a Hitec or Airtronics receiver. You can also cut off the three little 'teeth' on the Airtronics connector to get it to fit in another brand's receiver. Some of the Airtronics servos have white colored wires for the 'Signal' wire, so it's easier to determine which black wire is (+). I can't emphasize this enough, just be sure that if you connect Airtronics with the older (non-"Z" connector) to any other brand, that you reverse the (+) and (-) wires as you will burn out either the servo, receiver, or both. I usually wrap all my servos that I've converted to Airtronics polarities with a little 'band' of bright blue tape to remind myself that the servo is setup as an Airtronics servo. Lots of people are now asking, "What is the difference between analog and digital servos?" The motor of an analog servo receives a signal from the servo amplifier (inside the servo) at 30 times a second. This pulsing signal tells the servo motor when to start rotating and which way to rotate. Since it only happens 30 times a second, that's the minimum reaction time. Digital servos use a higher frequency amplifier that sends a signal to the servo motor 300 times a second (or sometimes more on very fast servos, such as those used for helicopter tail rotors). 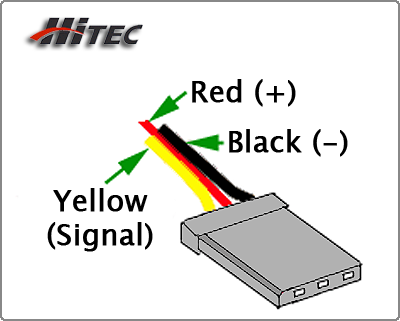 Since this signal is received by a digital servo's motor more often, it is able to react much faster and hold its position better. This means the servo has better centering and considerably higher holding power. This power comes at a cost, however, as digital servos tend to draw a lot more power from the on-board battery which means your battery just won't last as long. There are also different types of servo motors available: cored, coreless, and now brushless. You can read definitions of brushless, coreless, and cored servo motors in the glossary. For a listing of most the servos that are generally in use today and their specifications, click THE GIGANTIC SERVO CHART.